I don’t know about you, but I get annoyed when I have icons or shortcuts on the Windows Desktop for applications that I never use. Especially if the icon cannot be easily removed by dragging it to the Recycle Bin. This was the case with the Trend Micro Vault icon on my Windows Desktop. After weeks of suffering the sight of this ugly (in a figurative sense) icon, I finally found a way to remove it and uninstall TM Vault, which I have no use for. Here’s how I did it. Follow these steps to uninstall Trend Micro Vault. Open the Windows command prompt. You can do this by clicking the Windows orb on Windows 7/Windows Vista or the Start button on Windows XP, then clicking Run, and then entering cmd into the Run dialog box. When the command prompt window appears, enter cd (change directory) to switch to the root directory (usually C:). FileLockSetup.exe /uninst.This is the command that uninstalls or removes TM Vault. If you’re wondering what your command prompt should look like after you run this command, see the screen shot below. 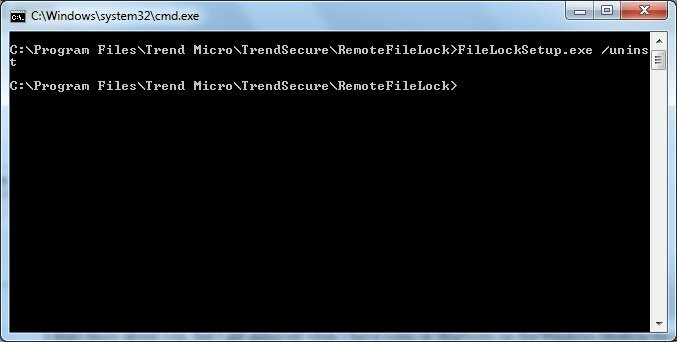 After you enter that command, the prompt will display C:Program FilesTrend MicroTrendSecureRemoteFileLock, which makes it look like nothing happened. Don’t be alarmed. Your command probably executed successfully, but they just forgot to add a confirmation message. Check your Windows Desktop. The Trend Micro Vault icon should no longer be there and your Windows Desktop is back to its lovely, pristine self (unless, of course, you saved a bunch of shortcuts there). You have completed uninstalling Trend Micro Vault from your computer. Hooray! If you tried these steps, let me know if it worked for you or not. Also, if you have questions, just leave a comment. To properly remove the Trend Micro Vault from your PC, please apply the procedure that I’ll provide below. 2. Type in "regedit" (without the quotes) and press Enter. The Registry Editor window will appear. After applying the procedure, your Trend Micro Vault should no longer appear on your PC. I tried your suggestion, but I cannot find the FileLockSetup.exe file. I don't have the padlock, but I still have the folder labeled Trend Micro Vault. Any suggestions?